This is an example of the Monotype Corsiva (quote) and the La Portenia (name and dates) fonts and includes a special paw prints design. 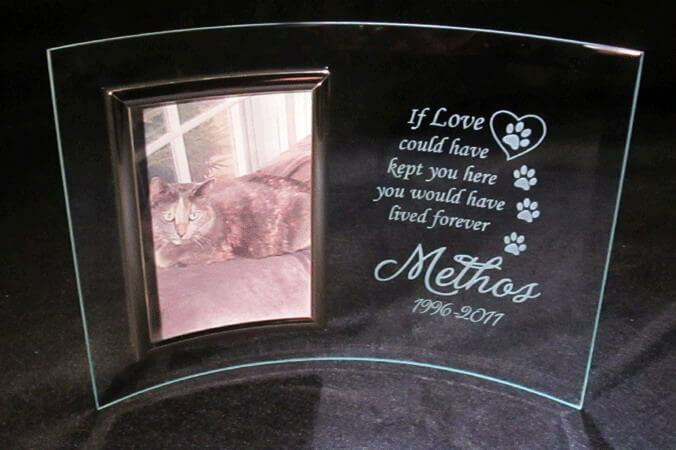 This frame is the perfect size to memorialze your pet. Along with the 3" x 5" picture, you have a 5" high by 4" wide area for the inscription of your choice, up to 8 lines. If you would like to pet memorial frame as displayed in the image, please note it in the comments box below and include your pet's name and date(s). To view other pet quotes, see our Pet Quotes page.